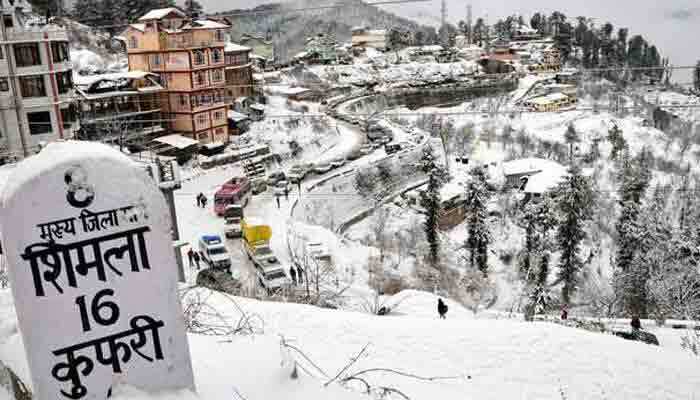 Shimla: The tourist resorts of Kufri and Narkanda near Shimla experienced mild snow in the past 24 hours, the weather bureau said on Monday, triggering a rush of tourists. The state capital remained cloudy a day earlier and experienced a sunny morning on Monday. Shimla recorded the minimum temperature at 3.9 degrees Celsius, an official of the Met department told IANS. Nearby tourist spots like Kufri, Fagu and Narkanda experienced mild spells of snowfall. Khadrala and Theog in Shimla districts recorded 10 cm and 2.5 cm of snowfall, respectively. “High-altitude areas of Lahaul and Spiti, Chamba, Mandi, Kullu, Kinnaur and Shimla districts have been experiencing mild to moderate snow since Sunday, while mid hills getting rain,” the official said. Kalpa in Kinnaur district recorded a low of minus three degrees Celsius while the temperature was nine degrees in Dharamsala, minus 0.6 degree in Manali. Keylong in Lahaul-Spiti district was the coldest in the state at a low of 3.2 degrees below freezing point. The Met Office forecast said western disturbances – storm systems originating in the Caspian Sea and moving across the Afghanistan-Pakistan region – would remain active till January 6, bringing more rain or snow.